We sit in front of our computers most of the day, connected to our friends and co-workers by the series of pipes, strings, and nimbostratus zackets called the Internet. Many times per day, things flash before our eyes—videos, photos, songs, sites—that are funny or strange enough to warrant sharing with other people. We salute them with a hearty "Great job, Internet!" Internet entrepreneurs are everywhere, and as with every other aspect of life, there are stupid people and smart people involved. Sometimes you come upon a genius of the rare type that mixes peanut butter with chocolate. Well, the world has found yet another combination: Netflix and Nicolas Cage. Genevieve just sent me the link to Cageflix (which she found via Videogum), which smashes those two amazing concepts together. 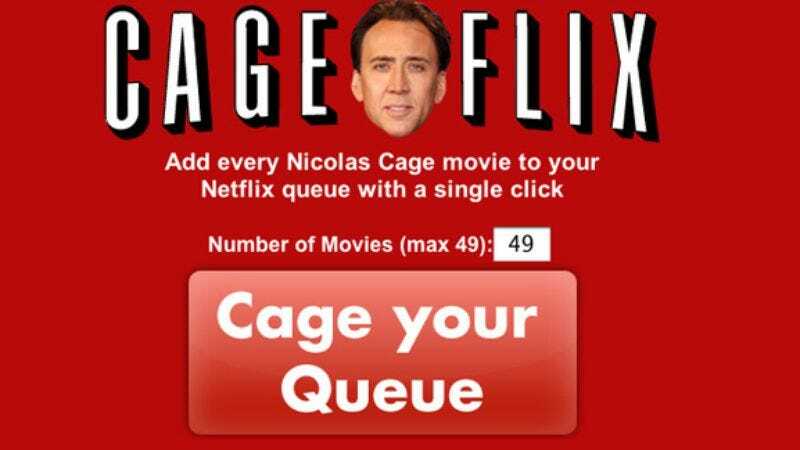 With the touch of a button, you can add EVERY Nicolas Cage movie to your Netflix queue. You're a little bit tempted, aren't you? Here's the link. Do we smell a book deal?